We’re in the swing of summertime and as the weather is getting hotter, people are looking for quick and easy ways to cool off. Whether you are going to Falls Lake, Kerr Lake, Jordan Lake, or Harris Lakes renting a jet ski could be just the right way to go in an attempt to beat the heat! We have some suggestions for you on when the best time to rent a Jet Ski to take out onto the water is. Your family summer camping trip. We all love our families but sometimes after staying in a tight, confined space for a few days like you need to with camping, tempers can flare a little bit. If your mother-in-law keeps yelling at you, you can send her for a nice cool down by putting her on the Jet Ski and letting her go. It’s hard to nag someone from the open waters. Before school starts up again. Give summer the one last big hoorah it deserves and send it out with a bang by hitting the lake on the weekend before school starts. Kids and their parents can go out on the lake to make memories and have fun all while getting a tan. This is a great way to have fun with your kids before the drag of school starts and steals all of their time away. The week of Spring Break. The weather is starting to get warmer and people are looking to have some fun after being stuck inside due to the cold weather for months. The perfect way to break your case of the winter blues is by grabbing a few of your friends and hitting the lakes with a Jet Ski! Jets Skis are a fun and easy way to make the most out of your time on the water. If you want to rent a Jet Ski in the Raleigh Durham area our team at Motor Boatin’ can help you out and make sure you enjoy your time on the water. Jet Skis vs. Boats: Which is Right for You? 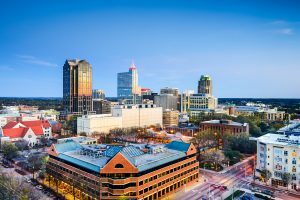 When it comes to playing outdoors, the fact of the matter is there isn’t a wrong way to enjoy your time in Raleigh, North Carolina! With our all beautiful trails, lakes, and other outdoor enjoyments, you can spend time in any of these places and leave feeling more relaxed. When it comes to your time on the water, many people wonder if a boat or a jet ski rental would be better for their situation. 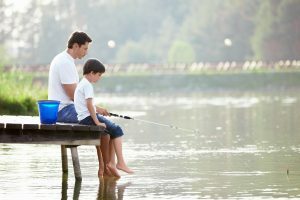 Here at Motor-Boatin LLC, we want to help you narrow down your options, so you can make the most of your time outdoors. Jet skis can do most things that boats can. They can tow people on tubes or skis, and they can be launched from most docks just as easily if not easier than a boat. Jet skis are a little more agile, since they’re smaller, meaning you can go faster and do more adventurous water activities if the thrill-seeker in you is wanting a little water time. Jet skis are great for date nights or small groups, but can also accommodate larger groups of people when you want to have beach time in addition to water time. Jet skis are fuel-efficient and can generally be launched from more areas, even without a dock. Some advantages of boats over jet skis are usually size related. If you want to take a large group onto the water, a boat will usually be a better choice. A larger boat means that you can tow one or more people on a tube. Additionally, you can spend all your time on the water if you prefer. When it comes to your time on the water, there is no wrong choice to make. Whether you choose a jet ski or a boat, you’re sure to have a good time on the water. Nothing is better than enjoying the beautiful waters of Falls Lake. There are many fun-filled water activities to do at the lake, one being jet-skiing. Jet skiing is a fun and adventurous way to amplify your Falls Lake experience. Fun: Nothing delivers accelerated excitement like riding a jet ski. 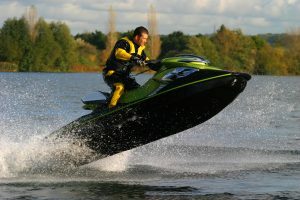 A jet ski pumps up the adrenaline and allows riders to explore the lake at high speeds. But, even better, you don’t have the hassle of maintaining a personal jet ski. Our jet skis at Motor Boatin are in pristine condition! Cost: Renting a jet ski is a cost-friendly, fun group activity with family or friends. Renting a jet-ski is an inexpensive thrill ride with customizable rates. Our rates allow renters to decide how long they want to be out on Falls Lake – whether a few hours or all day. Experience: Jet skiing is something exciting and new to experience. It’s a great way to get out of a comfort zone and take a risk. Whether riding solo or going with friends or family, jet skiing will be the highlight of your day at Falls Lake. Transportable: Our jets skis at Motor Boatin’ are stuck at Falls Lake! 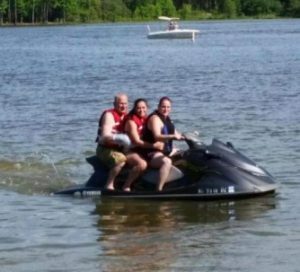 We love when our renters pick up our jet skis and take to other local lakes where they are meeting friend or family. Ready to try Motor Boatin’s jet skis or jet skiing in Raleigh for the first time? We have a fantastic team ready to help set up your rental and teach you to use our equipment. Contact Motor-Boatin today at 919-800-9716 and let’s set up your next rental. We’re known for our exceptional service of Falls Lake in Raleigh. We take pride in sharing our watercrafts with everyone in the Triangle and hearing their fun stories! Certainly, Falls Lake is a popular go-to spot for our locals, but did you know we also service other lakes in the area? That’s right! With a reservation and proper planning, we’re happy to deliver one of our beautiful vessels to another location. Just be aware, there is a $200 delivery fee to locations outside of Falls Lake. We are proud to service the following lakes around the Triangle, and here are some highlights of each location! Jordan Lake. For water lovers close to Apex, Jordan Lake has much to offer! This 14,000-acre reservoir boasts more than 1,000 campsites, seven swimming beaches, and a handful of boating ramps. This is a nice place to spend the day on a boat watching for bald eagles, osprey, and other wildlife scattered around. Kerr Lake. Located near Henderson, this lake hosts many events that are great to build relationships with the community. Whether you’re interested in a BBQ chicken dinner or live music, there’s something to enjoy at Kerr Lake! Plenty of boating ramps, beaches, and fishing areas of course. Harris Lake. Ideal for our residents in Holly Springs and Fuquay-Varina, this lake in New Hill is bustling with activity. There are play areas with volleyball courts and playgrounds, mountain biking trails, and even a disc golf course! It’s also a perfect location to take one of our fishing boats to spend the day reeling in the fish. If Falls Lake is out of the way or you’re simply just eager to explore other areas, don’t hesitate to give us a call at Motor Boatin’ to learn more about your boat rental options and our services. We are happy to help create memories that will last a lifetime! It seems the heat of summer has finally left the Triangle and our locals couldn’t be more excited! We have fabulous fall seasons here in North Carolina, and the beautiful vistas of Falls Lake are some of the best in Raleigh! Before the chill of winter sneaks in, our Triangle residents should consider having a weekend getaway at one of the spacious campsites along Falls Lake. There are plenty of activities to enjoy, even if the water is a bit cooler. Go Camping. First and foremost, pack up the bags and grab some food to enjoy the weather and camp out next to the water! There are more than 300 campsites along the access areas of the Falls Lake recreational areas. Do a bit of research on which access areas are better for certain activities. Some are reserved for non-gasoline powered boats, while others have better access to different hiking trails. Go Fishing. Give us a call to reserve a spacious yet sleek fishing boat to enjoy a lazy afternoon on the water. The fish are always biting and local anglers have lots of stories to tell about their favorite catch. Grill a Nice Meal. Before the sweet summer corn is out of season, grab a few ears and bring the hot dogs and burgers to enjoy a filling and delicious meal while surrounded by the autumn leaves. There are a number of grills and pits available at Falls Lake, so no need to bring your own. Boating on the Water. Of course renting a pontoon boat or a jet ski are still viable options to enjoy Falls Lake. We have plenty of styles and sizes to suit each individual or group need, so feel free to inquire about what’s available. Autumn is a lovely affair at Falls Lake, and our locals should not miss out on the promise of spectacular vistas that are to come. Contact us at Motor Boatin’ to get more ideas to plan your weekend at Falls Lake! August is like the Sunday of summer –the summer season will be ending soon, but there is still time to do the summer activities! Luckily in Raleigh, there are plenty of things to do with friends and family. As the Raleigh outdoor experts at Motor Boatin’, our team has developed a few favorite spots to spend the last few weeks of summer enjoying. Whether it’s taking hikes or spending time near the water, there is something for everyone! Falls Lake State Park. The perfect place to cool off on a hot August afternoon. With five swim beaches and 13 miles of trails, there is a lot to do! Rent a boat for the day and spend time on the water with friends and family for an unforgettable experience. American Tobacco Trail. When walking on this 22-plus mile trail, you will see bikers, runners, walkers, and even horses. It spans through several different counties, and the countless amount of trees along the trail offer plenty of shade. Eno River State Park. Set up camp next to the Eno River or explore what the park has to offer. Within the park are historic home sites, old forests, river bluffs, and of course, the river itself. Neuse River Greenway Trail. Perfect for a bike ride or a walk, this scenic trail offers 27.5 miles to be explored. Travel through wetlands, fields, and woods. Make sure to look out for some critters along the way! The Raleigh area offers so many different things to do this summer. If you need help planning a day out at Fall Lake or another nearby lake, we would love to help! Grab some buddies and go fishing, or take a hike through the many different trails. Don’t forget the sunscreen! Our local Falls Lake community is actively enjoying the sweltering summer months in the Triangle by spending time on the water! There are plenty of things to do, such as fishing, swimming, or relaxing on a nice pontoon boat. Our resident thrill-seekers are also zooming around on the awesome jet skis we have available for rent at Motor Boatin’! So many of our Raleigh customers choose to rent from us instead of buying a jet ski. There are several advantages to renting a jet ski, whether for a couple of hours or a whole weekend, and many Triangle residents prefer to rent them as needed. Buying a jet ski may seem like a cost-efficient decision, but considering they can range from $5,000-$18,000 they’re a rather expensive purchase. Not necessarily the best investment especially if the jet ski is only used sparingly. Renting a jet ski comes with the benefit of affordable prices based on the duration of the rental period. Whether it’s for a few hours or an entire weekend, renting is an affordable option for those who are unable to purchase a new or used one. No Upkeep. Renting a jet ski is a great option for people who don’t have the space to store the watercraft during off-seasons. It’s also beneficial for those who don’t have the desire to maintain the general upkeep of the watercraft, including cleaning, gassing, ensuring safety protocols, etc. Simply rent the jet ski and return it when done with no headaches! Time to Practice. Buying a jet ski is a big investment for people who may not be experienced with the activity. Luckily, when renting a jet ski users can get quick guides and tutorials, play around and get comfortable, and if it’s not a great fit there’s no financial commitment to a jet ski that will ultimately go unused. Whether you’re a watercraft expert or a complete beginner, the best way to get out on the water is by renting a jet ski from Motor Boatin’! Contact us today and let us equip you to enjoy all that Falls Lake has to offer this summer!